The RFID tag contains information about the object it is affixed to; it can be of different sizes that can range from small as a miniature to as large as a brick. Furthermore, while some tags are used simply as an ID associated with an object, others carry a variety of different attributes related to the object. 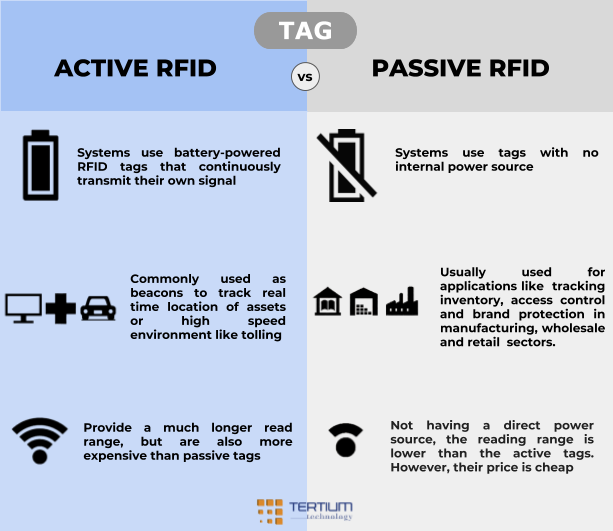 When we talk about RFID tags, another recurring distinction is between active and passive RFID tags. 2. What are the differences between active and passive tags? Active RFID tags have their own power source to transmit their signals to RFID readers. With a rather wide reading range, active tags are ideal for monitoring high-value objects with variable movement in large open structures. Active tags can transmit data constantly or periodically as a beacon that lights up in the night. 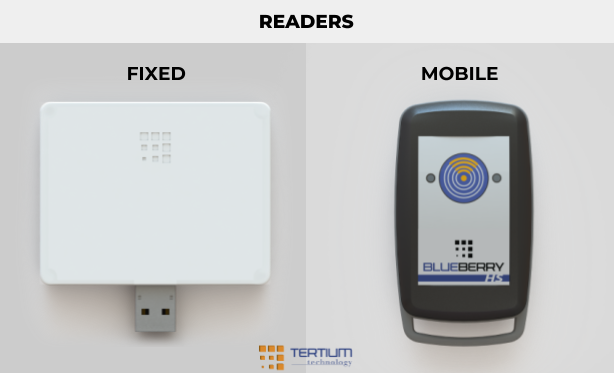 Passive RFID tags do not have a built-in battery or power supply, so they rely on a reader or integrator to “wake up” and provide the power to respond and transmit data. Compared to active tags, they have a reduced reading range, are smaller and less expensive. They are ideal for tracing a large volume of low-value items. 3. What is an RFID reader? An RFID reader is a device that uses radiofrequency to read information from an RFID tag. The reader, using an integrated or external antenna, acquires data from the tags, then passes the data to a computer for processing. As with tags, readers are available in a wide range for different applications and industries. Therefore, there are various criteria for grouping them: range, frequency, protocol types, power … the main distinction that can be made concerns fixed and mobile RFID readers. 4. What factors control the read range of a tag? RFID tags contain antennas and because larger antennas will broadcast farther than smaller antennas, generally speaking, the larger the tag, the longer the read range. It should, however, be remembered that the variation of the reading range is only partly determined by the size of the tag, in fact other factors must be taken into consideration such as: the type of tag and the frequency (for example, HF, LF, UHF). Orientation The read range around a tag is not spherical. The pattern of readability is also affected by the antenna of the reader, with circularly polarised antenna providing a shorter range but less reliance on orientation. A linear antenna can give a more impressive read range for a given tag, but turn the reader through ninety degrees, and the tag becomes invisible. Angle Reading an RFID tag from an angle (vs. straight on) will have a negative impact on reading range. In order to harness the most energy possible from the RFID antenna, the RFID tag should directly face the antenna. As for the tag antenna, even that of the reader if it is larger has a wider reading range. However, there may be some disturbing factors that reduce the reading distance. Higher power settings will result in a greater read range, while lower power settings will result in decreased read range. Also, in order to maximize read range, ensure that your reader is set to its highest receive sensitivity. Water, metal, fluorescent lighting, large machinery, and competing frequencies (other radio waves) may adversely affect RFID read ranges. The best way to maximize read range is to note the various possible forms of interference and attempt to mitigate that interference by testing. 5. What is the difference between low-, high-, and ultra-high frequencies? The communication frequencies between reader and tag depend both on the tag and on the expected applications and are regulated (to control power emissions and to prevent interference) by international and national organizations. LF (125-135 KHz): usable worldwide with limited reading distance and applied for alarms, keys, etc. HF (13,56 MHz): standardized by ISO 14443 and ISO 15693 standards; it is used worldwide, with reduced reading distance (up to 1.20 m) and applied for pallets, access control, apparel stores etc. UHF (868-915 MHz): meets local limits defined by the authorities of the individual countries. It is applied for pallets, containers, etc. 6. How do I know which frequency is right for my application? Different frequencies have different characteristics that make them more useful for different applications. For instance, low-frequency tags are cheaper than ultra high frequency (UHF) tags, use less power and are better able to penetrate non-metallic substances. They are ideal for scanning objects with high-water content, such as fruit, at close range. 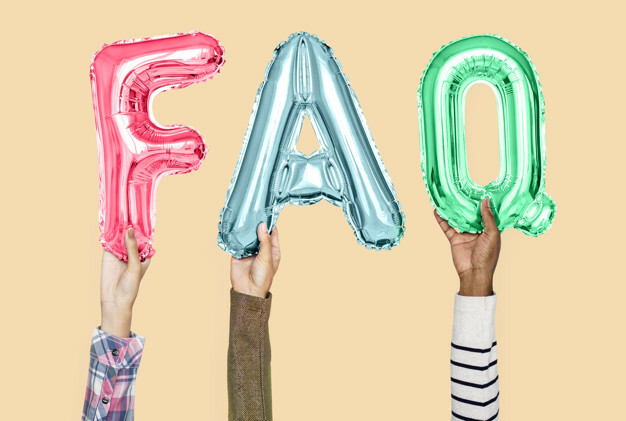 UHF frequencies typically offer better range and can transfer data faster, but they use more power and are less likely to pass through materials. That’s because they tend to be more “directed,” they require a clear path between the tag and reader. UHF tags might be better for scanning boxes of goods as they pass through a bay door into a warehouse. 7. Do all countries use the same frequencies? Most countries have assigned the 125 kHz or 134 kHz area of the radio spectrum for low-frequency systems, and 13.56 MHz is used around the world for high-frequency systems. 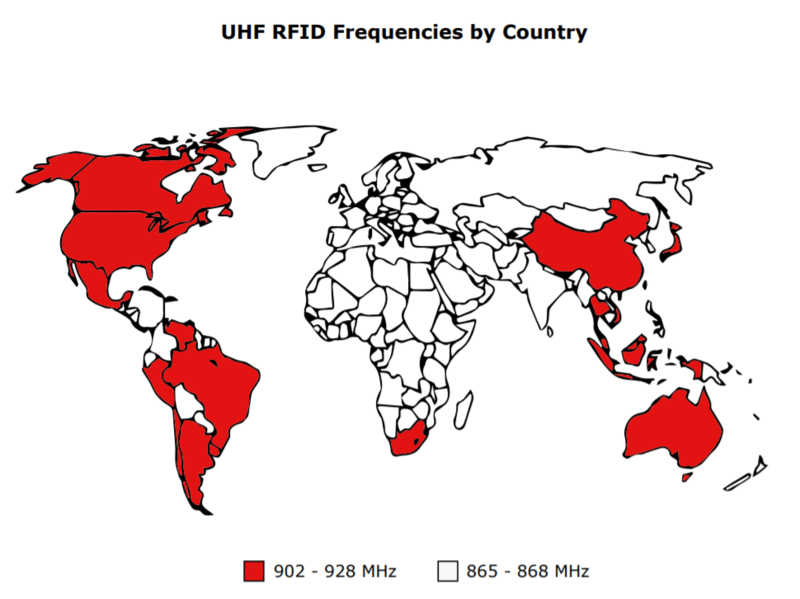 UHF RFID technology uses two main frequency ranges — 902-928 MHz and 865-868 MHz. Each country adopts the frequency according to its own regulations. 8. Main differences with barcodes? Flexibility, as no optical visibility is required. Robustness, because the tags can be incorporated directly into the pallets or boxes, receiving further protection. Thanks to the appropriate anti-collision mechanisms, the multiple and simultaneous reading of the tags are possible. Taking as an example the reading of a pallet; with a barcode system, it would be necessary to disassemble the pallet and read box per box. Instead, through the radiofrequency, it is possible to simultaneously read the contents of the entire pallet. Once printed a barcode is unmodifiable. This does not happen for RFID tags whose chips have a memory that can be rewritten ensuring greater accuracy and flexibility. Obviously, compared to read-only tags, there is a substantial cost increase that is as much greater as memory capacity is. The survival of a barcode is closely linked to the environment in which it operates. In particularly hostile environments, it can easily be subject to wear and dirt making impossible to scan it. This is not true for RFID tags that can work seamlessly in harsh environments. 9. Are there any health risks associated with RFID? RFID uses the low-end of the electromagnetic spectrum. The waves coming from readers are no more dangerous than the waves coming to your television or radio. 10. How much information can the tag store? The storage capacity depends on the type of tag used. There are tags used as simple identification that only contain a serial number of 96 or 128 bits. Most RFID tags for industrial applications have a maximum memory of 2 KB, sufficient to store information and an identifying number of different data associated with the product. Some manufacturers also offer special RFID tags with a high memory of 4 KB to 8 KB, mainly used in the defence sectors. 11. Which applications and industries use RFID technologies? 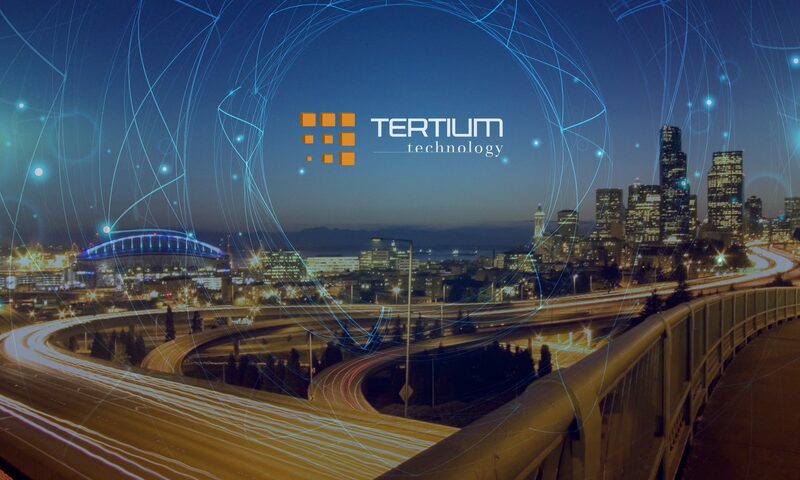 Automatic identification technologies are an important part of the entire supply chain, as they facilitate and optimize the different stages of production processes, highlighting any problems and malfunctions. RFID in the fashion sector allows to maintain balanced stocks and to make quick and efficient inventories. It allows to carry out a capillary control of the production for efficient order fulfillment and traceability of the fashion item. RFID is also perfect for verifying the authenticity of a product and if its sale takes place only through official channels. The contribution of RFID in this area can translate into concrete benefits for the many operations that lead to the creation of a vehicle. 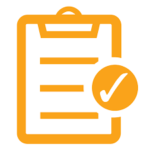 Among these: automatic control of the correct composition and assembly of components, frequent and precise inventories to ensure replenishment as punctual as possible, asset tracking, automatic monitoring of the production progress. The use of RFID technology associated with the aforementioned activities generates a reduction of errors, therefore costs, combined with a greater product quality to the advantage of customer satisfaction! 12. What are the main benefits of RFID? 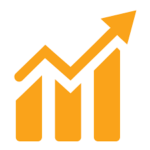 There are some serious business benefits for implementing RFID technology. Overall, RFID makes the business more efficient by drastically reducing the risk of human error. 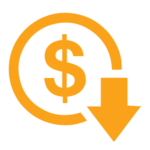 This leads to a saving in terms of time and money which translates into lower costs.